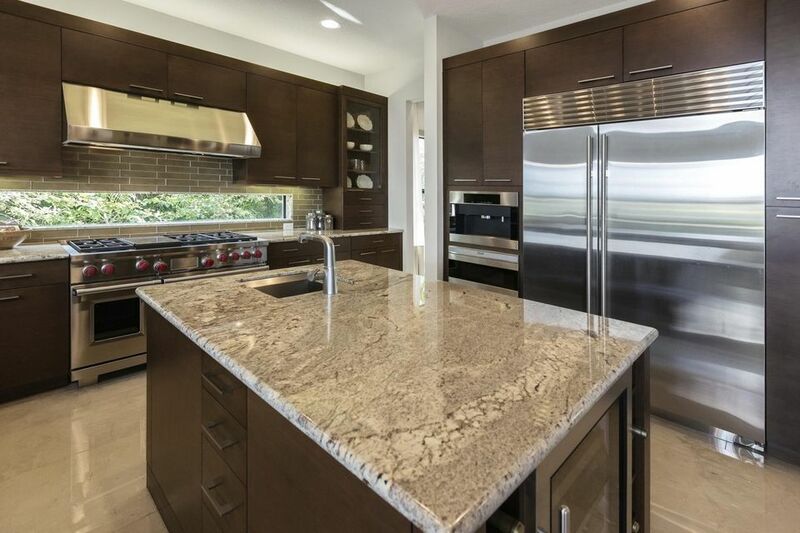 Granite, while hard, is surprisingly absorbent. In fact, just in terms of practicality, man-made surfaces such as Corian tend to deliver the goods better than stone. People buy granite countertops more for natural beauty than for pure practicality (in fact, granite is also susceptible to scorching from hot pans). Great - just what you wanted to hear? Sealing your granite is one of the many things you just need to put up with if you want to own this type of countertop. When you think about it, it should come as no surprise that granite needs to be sealed. It is like any other organic material. Wood has its grain, and stone has its porosity. Black Diamond Nex-Gen Granite Stone Sealer is a type of product that you see on store shelves quite often, and the price is reasonable. Keep in mind, the price is really not much of an issue as this stuff goes a long way. Just a few squirts are usually enough to fully coat an average-sized bathroom counter. Yes, you will be doing two or three coats on the counter, but you will find that each subsequent coat spreads even a little bit further. Granite stone sealer is nothing to stress about. If you don't get it on right away, it's not like your granite is permanently damaged for life. But certainly seal before the water gets on your counters, and especially before any kind of stains occurs. With all respect to you for your fine work in the stone industry informing the public about the pros and cons of different products, I should like to inform you of my concern over a comment you made in your article about the importance of sealing granite counter tops. You cautioned your readers how important the sealing of the granite is because if stains occur prior to sealing, they will become permanent. This is not necessarily true. There are many ways to remove stains from granite and marble by using varying types of poultices. Depending upon the type of stain it is, there is usually a way of removing the stain with a regimen of applying poultices. I only mention this because I wouldn't want a potential customer for granite or marble counter tops to eliminate those types of stone because of laboring under the impression that all stains are permanent. A very common and effective procedure to remove many types of stains is to make a paste mixture of hydrogen peroxide and diatomaceous earth and place it over the stain. Then cover it with plastic wrap and seal the edges of the plastic with masking tape and leave it on the stone for a couple of days, then remove the plastic wrap and let the paste dry and many times the poultice action and drying process will pull out the stain. Repeat if necessary. Also sometimes bleach can be added to the mixture. Also there is a guy who has a PhD in chemistry [Dr. Fred Huston]. He has specialized in products that he has developed that will remove stains from stone, concrete etc. We have used his product called Blue Be Gone and it worked! The blue stains are caused by a chemical reaction to certain glues that are used in making seams in counter tops. It is especially a problem when you are dealing with very light colored stone. We had a serious problem with the blue staining on a job that the slabs alone cost in excess of $2500 each. Out of desperation to cure the problem we stumbled on to this guy and his stain remover worked!! Corian or Silestone, Which Counter Is Best For Your Kitchen?